Brrrr… What’s going on with that climate change? The cold last week was stunning, and it had some people asking a question. If the weather is so cold, how can climate change be real? To answer that question, it’s really important to make one very important point. Weather and Climate are two very different things. How is that different? I always like to use the human body as an example since that’s something we can all relate to. Weather for example is how our body feels at this very moment and over a short span of time. You may feel great, or you may have had a cold or a fever for a few days and don’t feel very well. Overall, that’s not a reflection of your long-term health. Climate on the other hand is a lot more like your long-term health. Think more along the lines of, do we have healthy diets or not? Are we physically active or not? Do we live in places that have good air and water quality or not? Are we surrounded by the people, places, and activities that make us happy? Chances are that for folks who answer yes to those habits over a very long span of time (on the order of decades) are pretty healthy. It doesn’t mean that they never get sick, but on average they feel pretty good. Back to the Earth, Maps 1 and 2 show how much warmer or colder than average the air was worldwide 2 weeks ago, and today. 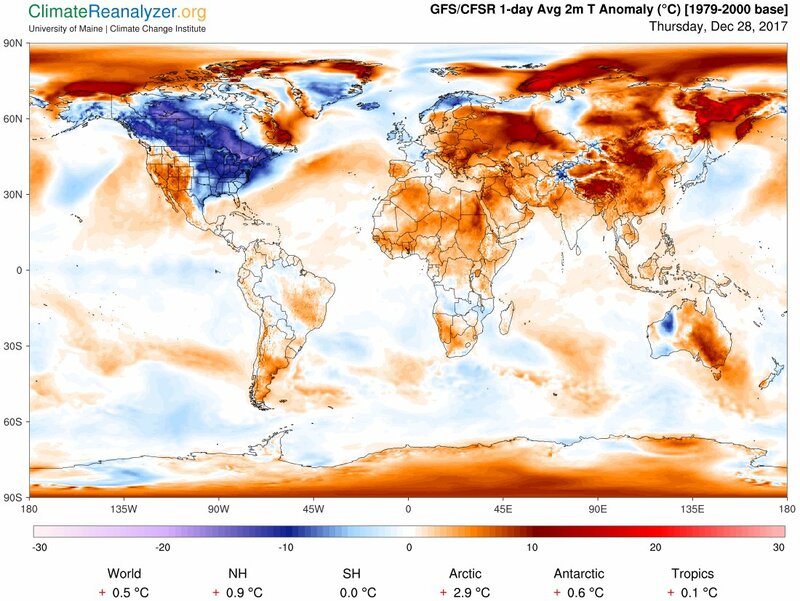 As seen on Map 1; while the eastern half of the United States had an abnormally cold end to 2017, the weather in much of the rest of the world was warmer than average. On the other hand, when you look at Map 2, you may notice that the pocket of colder than average air is locked up mostly in western and central Canada while the eastern half of the United States (and most of the world) is much warmer than average. That’s primarily because weather patterns change, and cold as well as warm weather around the world is constantly fluctuating depending on air patterns and the season. Moving from weather to climate; while these maps show us the weather on a particular day or week, the information that makes the map is collected over many many years to create a climate record. While weather anomalies (abnormal weather) are normal, in a balanced climate you would expect there to be about as many record low temperatures as there are record high temperatures over the course of many years and decades. What concerns many climate scientists is that over time, according to the National Oceanic and Atmospheric Administration, we have arrived in an environment where there are over 2.5 times as many record high temperatures as there are record low temperatures set per year (and rising). This is happening while average year round temperatures are going up and up and up. 2017 for as cold as it ended in fact is shaping up to be the second warmest year ever recorded. Ten hottest years on record, all since 1998. Preliminary data shows 2017 was the second hottest year ever recorded. and governments world-wide, as over 97% of climate scientists through research have come to an agreement on this conclusion. Going back to our bodies, if you went to 100 doctors feeling unwell with a high temperature, and 97 of them told you that you have a fever and you need rest, would you listen to them, or would you listen to the 3 that tell you that there is nothing wrong and you need to go back to work? I’d listen to the 97. To learn more about how climate change works, please check out our previous blog, and read what experts at NASA, the NOAA, and even Shell and Exxon Mobil are saying! Interested in learning more? Join us at the Millvale Moose on Thursday, February 22nd at 6PM for a friendly conversation on climate change. We will walk through the latest research together to gain an understanding of why the climate is changing. Skeptical of climate change or still unsure? You’re more than welcome, as we always appreciate a healthy conversation. In the mean time, looks like a big snow is around the corner. Stay warm, folks!